An international team of scientists has discovered a new technique to create fully electronic fibers that can be woven into today’s everyday clothing. Wearable electronics is an emerging field where sensors and wireless communications are incorporated into traditional clothing manufacturing. But unlike typical sensor networks, wearable electronics must be able to adapt to changes in the shape, motion and direction of the wearer—while remaining comfortable to wear and providing accurate information. So far, “smart textiles” have not been able to overcome that significant roadblock. Today, wearable electronics are made by gluing devices to existing fabrics. The results are too rigid and bulky for flexible textiles, resulting in a higher risk of breakage or malfunctioning and accuracy degradation of the information these wearable devices collect. Scientists have been working on a way to incorporate electronic components into the textile itself. "For truly wearable electronic devices to be achieved, it is vital that the components are able to be incorporated within the material, and not simply added to it,” said Professor Monica Craciun from the University of Exeter Engineering Department. Craciun’s team may have found a solution. The new method integrates the electronic devices directly into the fabric by weaving graphene fibers into the material. 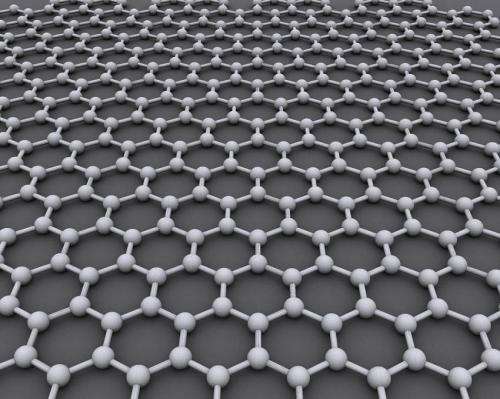 Graphene, which is a mere one atom thick, is the thinnest substance capable of conducting electricity. It is both strong and flexible, making it an ideal material to use in creating smart textiles. The scientists used polypropylene fibers, which are already in use in the commercial textile industry, to connect graphene-based electronic fibers together. Craciun’s team had already developed a technique to create graphene electrodes in polypropylene fibers. The result: textiles that can have touch-sensor and light-emitting properties—creating truly wearable displays that don’t need electrodes, wires or other bulky electronic devices. "The key to this new technique is that the textile fibers are flexible, comfortable and light while being durable enough to cope with the demands of modern life," said Ana Neves, coauthor of the research paper published in Flexible Electronics. This discovery could make it possible to ditch the fitness tracker or smart watch on your wrist for clothing that can fulfill health, safety, lifestyle, computing, augmented reality and connectivity applications. Want to read more about wearable electronics? Check out Computerized Temporary Tattoos Could Transform Wearable Electronics.